Events & Blog: WESTMINSTER HERE WE COME!!!!! 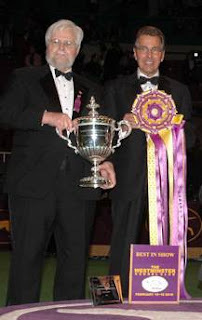 Well, we received our conformation for Chewee's entrance at the Westminster Dog Show at Madison Square Garden. The show dates are Feb 14 and 15. We will be in ring 5 at 12:30 on Tuesday Feb 15th with all the other Leonbergers. We are so excited and Chewee has been resting up for the big day. There will probably be about 20 thousand people that will be watching. So, if you want to come on down and see us, make sure you come back stage for a visit. See ya there! AUTUMN BRIES is a TV STAR!!!!!! Furion hits the stage with "ANNIE"
Chewee Plays SANDY in the play "ANNIE"